... Equals Punch's first point! Thank you judge Sherry Swanson! During Punch's second weekend out, at the Umpqua Kennel Club on November 18, 2011, he was Best Puppy and took a Puppy Toy Group 4th! 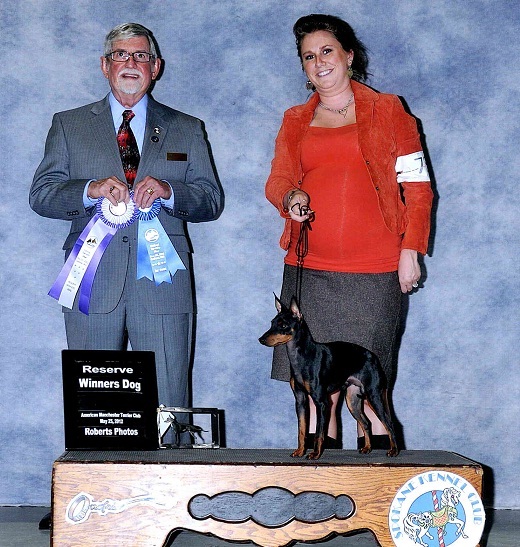 Punch earned a 4-point major during his third weekend of showing at the Santa Cruz Kennel Club Show on December 3, 2011, under judge Leonard S. Reppond! Punch earned his second major with a Best of Variety at the Nor-Cal Toy Fanciers Show on February 18, 2012! Thank you Judge Nancy Smith Hafner! 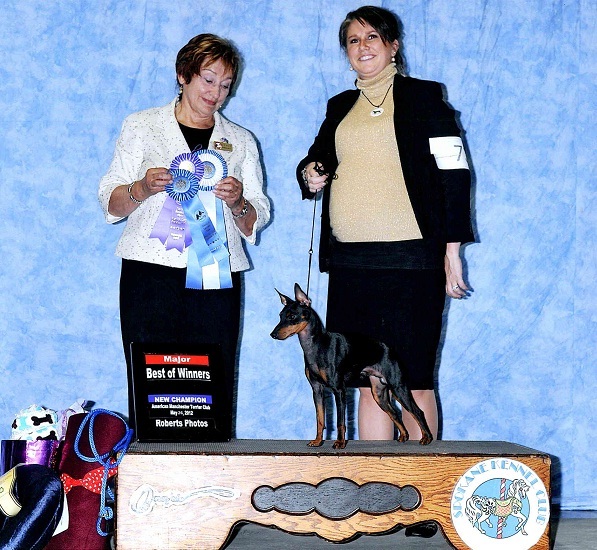 Punch was Reserve Winners dog at the 2012 American Manchester Terrier Club National Specialty on May 25th, 2012, under breeder-judge Rodney Herner. A New Champion! 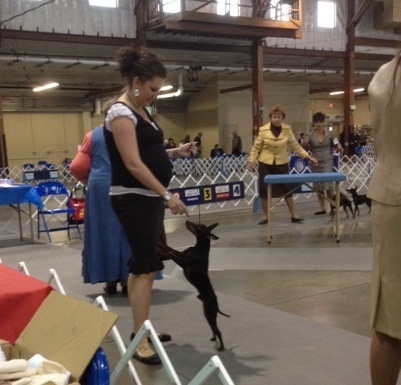 Punch finishes at the American Manchester Terrier Club's District 8 Specialty by going Best of Winners on May 26, 2012, under judge Lynne Myall! 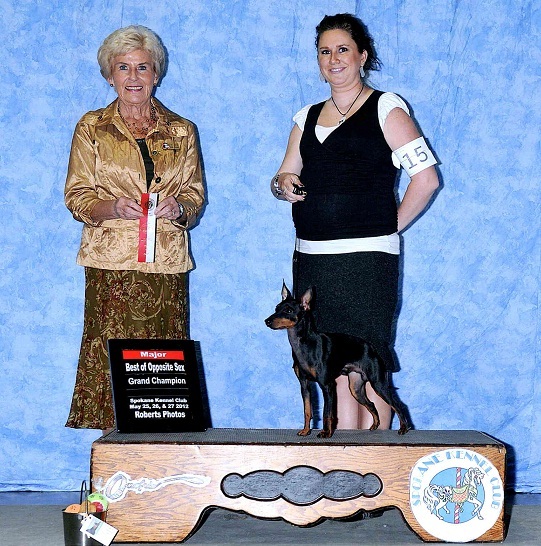 As a move-up special, Punch earned a Grand Champion major by defeating 17 dogs under judge Toddi Clark at the Spokane Kennel Club on May 27, 2012! 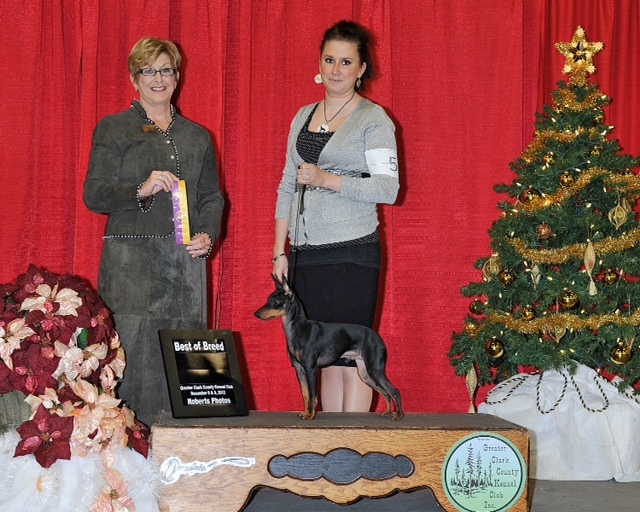 Punch earned two more points towards his Grand Championship at the Greater Clark County Kennel Club show on December 8th, 2012, under judge Charlotte P. Patterson. Punch adores his Mommy and adores showing! Punch practicing on the table at 4.5 months old.